Why is no one entering my Halloween contest? Now I am depressed. So in a previous post (which has now self-destructed), I mentioned that my ideal ending to a love triangle would be to just kill of the girl. But a close second to that ending is this: I wish that out of the two guys, the one who the girl is leaning towards, the one she truly loves and feels a closer connection with--I wish that he would die. Then the girl will marry guy #2 by default, but both of them will know that he's only second-best and will never live up to guy #1. HAHAHA isn't that great? That way no one's happy! I told you I like tragedies. Anyway, I'm enjoying Clockwork Angel immensely. I'm probably going to read the whole series now. Darn you Cassandra Clare! You have snagged me. 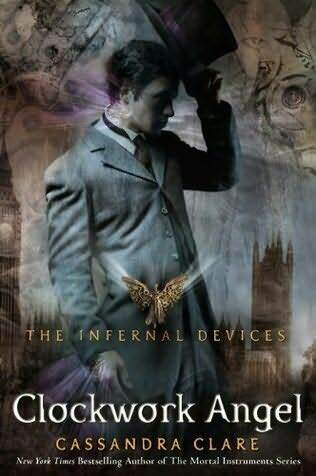 Instead of a quiet Friday night with brownies and beer, I am lost in your world of Nephilim and warlocks and infernal devices. Dagnabbit you! And I lovelovelove me some tradgedy in a story, too. That sounded weird. But I do. omg, i'm the same way. if there's a love triangle (or square or whatever), i tend to either kill of the guy she wants or make him totally unattainable. i'm mean like that. I just read City of Bones and was surprised by how much I enjoyed it. Cassandre Clare writes a pretty engaging book.